The monks’ message to us is to live a life of love, kindness and compassion – and to simply “slow down” and enjoy each moment. We each need to give ourselves space to just “be” – and practice mindfulness in whatever it is that we are doing and pay attention to the little things. 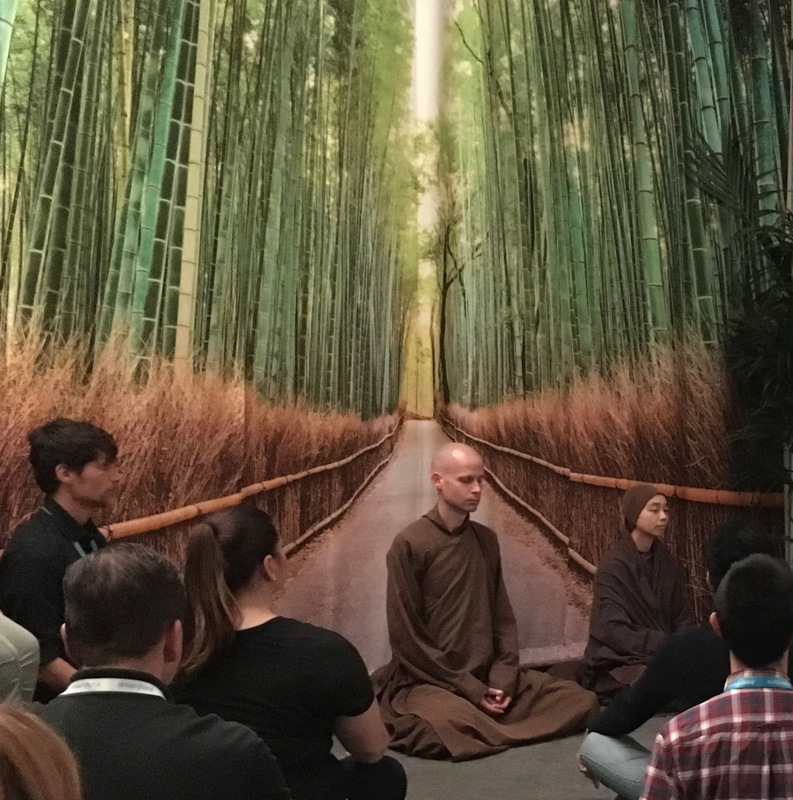 One of the monks, Brother Phap Lai shared that meditation is a way of life and that by integrating it into our daily routines, it can bring many benefits, including a more genuine long lasting happiness. 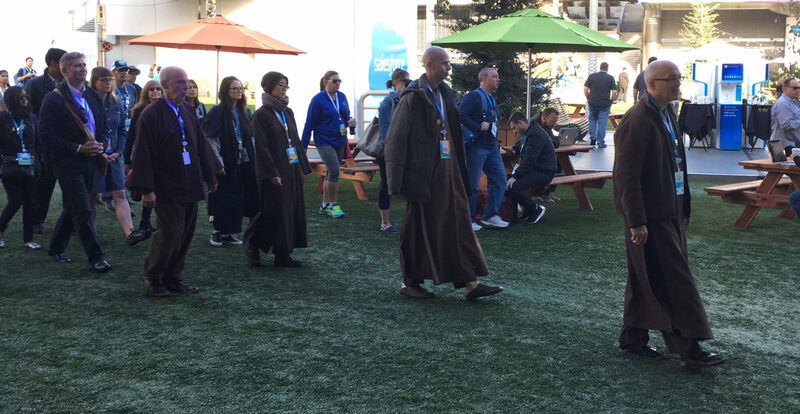 Our day began bright and early with the monks teaching us how to walk mindfully, slowly, totally relaxed. This was a challenge for me because even though I love to walk, I prefer to walk quickly. I’m trying to be more aware of mindfully walking and apply that to certain situations when I’m out and about. Focusing on a mantra can often help keep you in the present moment. Here are two of the mantras that the monks shared with us during one of our early morning walking meditations around Moscone Center. Walking very slowly, take three steps as you inhale and say the words “I have arrived.” Then take three more steps as you exhale and say the words “I am home.” Another mantra you can use while repeating this three-step process is to say “Mother Earth” as you inhale and “here I am” as you exhale. Halfway through the walking meditation, we stopped in an open area where the monks guided us in stretching, breathing and balancing poses that they do every morning back at their monastery in Southern France. This was a little challenging to say the least as most of us were dressed in jeans and wearing shoes – I yearned to be in my yoga pants and barefoot! Nonetheless, it was a great way for us to wake up our bodies and our minds for the day ahead. 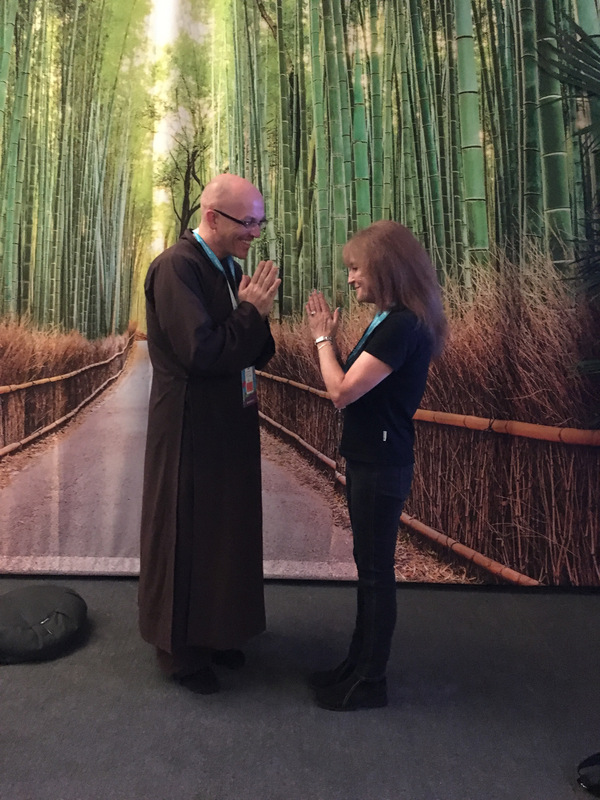 The monks also encouraged us to make time for the people in our lives that matter the most – to be present and give our full attention to those around us – to turn off our cell phones and to talk to each other when we get home from work. Mindfully be there for each other – be fully present. Forgive. Let go of anger and resentment. And most of all, be compassionate – to others and to ourselves. 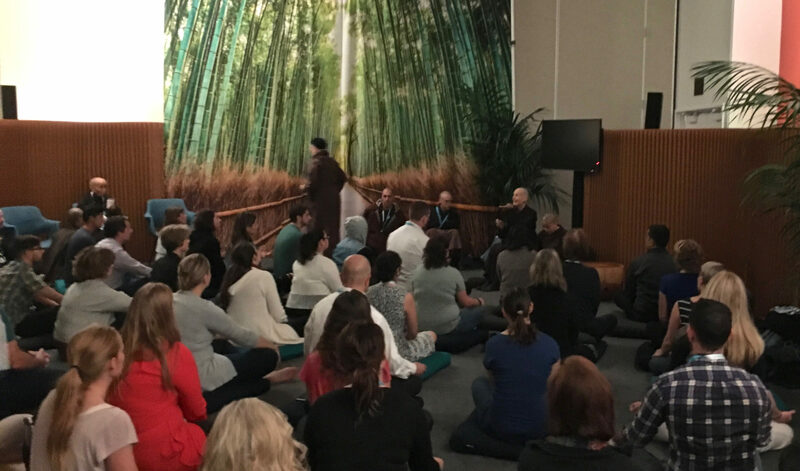 The final day of the conference featured a Day of Compassion, ending with 24 monks gathering on stage to perform their Chant of Compassion. A chant for ourselves. A chant for everyone in the room. And a chant for the world. It was extremely powerful and harmonious. Listen to a brief 23-second segment in the above video. When speaking with Brother Phap Lai, I couldn’t help but notice his British accent. Before moving to the monastery in France, he mentioned that he lived in Ruislip, a little town just outside of London – and that just happens to be where I grew up before moving to California… talk about synchronicity! It really is a small world and another reminder that we are all inter-connected. Learn how to slow down and meditate starting with a 60-second quickie meditation!